Eric Mendez, a UPS delivery driver, may have simply been in the right place at the right time when he happened upon a drowning baby Wednesday evening. It was his quick reaction to the situation, however, that made him a hero that day. At about 7 in the evening, a two-year-old fell into the pool at the Kingston Port Apartments. Eric was delivering packages just a few feet away. He heard the child’s screams and decided to investigate. 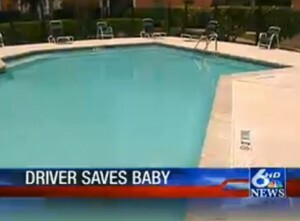 There, he found the lifeless toddler and performed CPR, saving his life. Eric says his mind was also on his daughter as he tried to fill the little boy’s lungs with air. After about a minute of CPR, the little boy started to breathe again. Paramedics then arrived and transported him to Driscoll hospital. First responders on the scene are calling Eric a hero; they believe that his actions meant the difference between life and death for the little boy, who is reportedly in stable condition. “We felt that his actions were the deciding factor in the life of this child,” Goodman said. The first response team wants to award Eric with a citizen’s lifesaving award, but Eric doesn’t really see himself as a hero. In fact, he went right on delivering packages right after paramedics took the boy away. 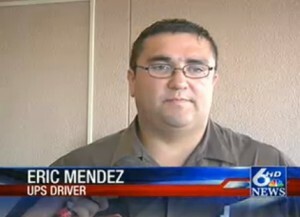 “I am a normal UPS guy, at the right place at the right time,” Eric said. Eric did admit, however, that while he is working hard, the boy and the boy’s family are still in his thoughts and prayers.